Description: Loaded coal train waiting to depart. Description: A long BSNF coal freight approaches out of the afternoon haze, eastbound on the NS mainline at Pine Junction. Description: Rolling across the UP. 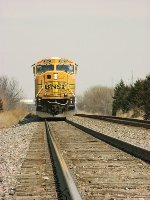 Description: Westbound with a rare consist; three matched BNSF units. Description: Taken with the cell phone. Obviously a little slow to shoot, oh well, add the 9963 to the roster if it isn't already there! Description: Empty WPSX coal train. Description: An SD70MAC makes a rare appearance in central Oregon on the BNSF Oregon Trunk Sub., and even rarer appearance on the lead. Description: An SD70MAC makes a rare appearance in central Oregon on the BNSF Oregon Trunk Sub., and even rarer appearance on the lead. Flags flying for 4th of July. Description: Province Line Road. 2027 hours. Description: All EMD lineup powers NS freight 39G off the shared assets Delair Branch at Strawberry Mansion. Description: BNSF pair 9963 & 8897 heads through Blandon leading 38G. Description: BNSF pair 9963 & 8897 are both showing a little aging as they lead 38G through Royersford, Pa.